Drawing your plays, play cards, and playbooks is fast and easy with Football Play Card. With the drawing tools, you can quickly select the built in routes, blocks, coverages, rushes, blitzes, and player shading to automatically draw them or you can draw your own with four different line endings, two line styles, three line weights, and ten line colors. To draw using the built in actions, click or tap on a player and select the route, block, rush, coverage or shading that you would like to add to a player. To draw your own route, block, rush, or coverage, simply click or tap on a player and then select the “Draw” option from the context menu. Next, click and drag the line where you want it to go. To add another segment to the line, click the line ending (arrow, block, circle) and the next segment will appear. You can then add and drag as many new line segments as you would like. ​To draw anything else, select the marker from the drawing toolbar. To erase the marker drawings, simply select the eraser, tap anywhere on the marker line and the entire line will be erased. Add a route, block, or shading to an offensive player by tapping/clicking on the player’s circle and selecting the action. Add a coverage or rush action to a defensive player by tapping/clicking on the player letter and selecting the action. 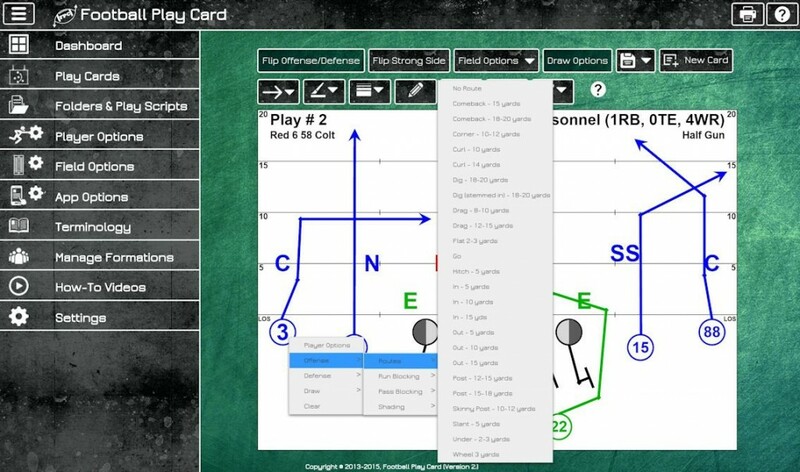 Log in now to draw the perfect play card using the built in actions and drawing tools and to check out all of the latest functionality enhancements. 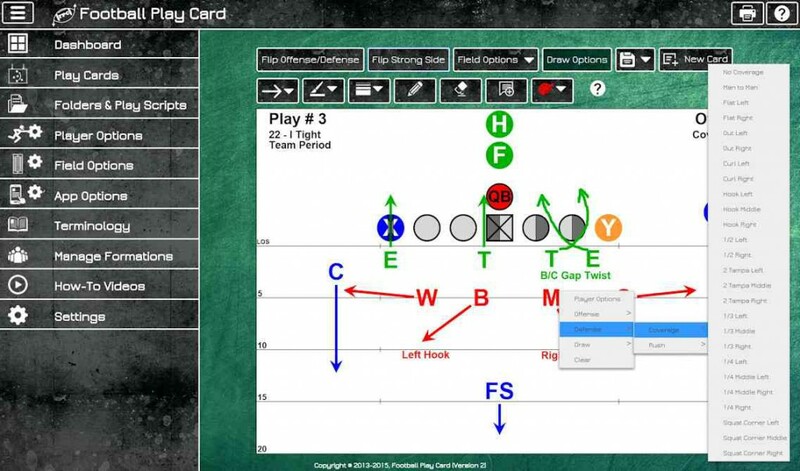 This entry was posted in Quick Tips and tagged Draw Coverages, Draw football plays, Draw Play Cards, Draw Routes, Drawing Tools, Football Play Card. Bookmark the permalink.